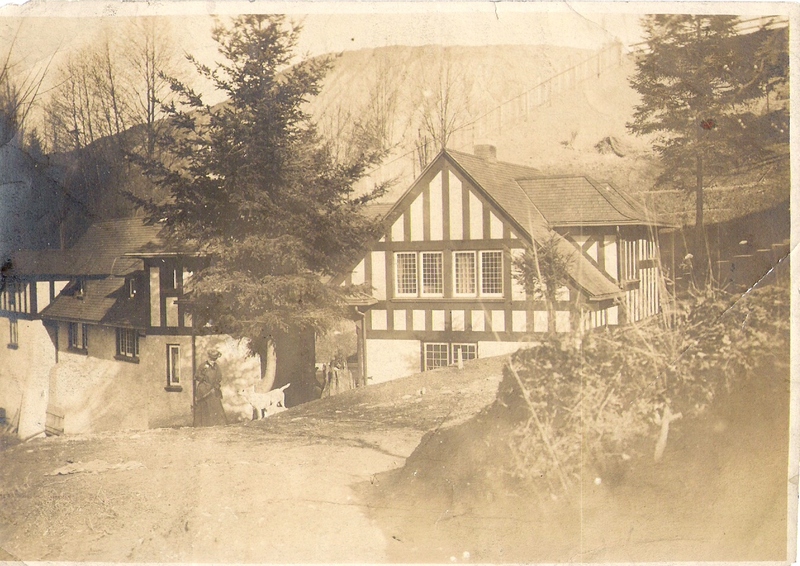 It is unclear exactly when our street was first graded, however it must have been around 1900 because the Ferry Leary House, constructed in 1904 had stables which could be accessed from Broadway and a wagon road leading up the hill to allow easy access to both it, and the Ferry House (due south on 10th). The street was surveyed around 1905 in preparation for paving in 1910-11 in conjunction with the construction of both sets of stairs. The contractor met with many challenges during that time, including several slides around Howe St. The Ferry Leary estate extended from what is now 10th Ave E to what is now Lakeview Boulevard thus preventing the city from extending Broadway further to the south. It wouldn&apos;t have mattered much, because the hill quickly gets to steep to traverse with a road. The city engineers wisely chose to continue Broadway at Highland where the topography again leveled out. It is unclear how long the Ferry Leary stables were used before being torn down. The roadway shows up in a 1924 Sandborn Fire Insurance Map, and again in a 1936 aerial photo. The foundations of both buildings are still there, as well as the Olmsted influenced walls. Hopefully one day they will all be brought back to the light of day. Seattle Municipal Archives has a few slides of a fairly substantial slide that happened at the southern turn-around in 1935. It&apos;s unclear from looking at the photos if it was caused by the installation of the gas line that was being installed at that time. This slide may have effected both sides of the roadway which was at that time still at grade with the roadway in front of the garden&apos;s garages. From what we can piece together, at least one house was moved from the slide location and relocated elsewhere. Another slide happened in 1948 and is likely the slide that caused the turn-around to be lowered. In 1888 the land between Blaine and Howe and between Lakeview and 11th was platted as Wirth&apos;s Addition. In 1890 a similar piece of land was platted south from Blaine to the Ferry Leary Land Company&apos;s claim at what is now the turn-around on Broadway and was named Broadway&apos;s Second Addition. Several maps from 1890 show the street system as already being well established, though it&apos;s unclear if everything was built (probably not). In 1885 Seattle had passed a measure to bring better cohesion to the street system, causing many of the streets on First Hill, and Capitol Hill to be renamed, as well as a number of the downtown streets. Search for your favorite street name here and check out how complicated things were back then. The naming of the streets stayed the same until 1961 when Seattle again recognized the directional schemes of the streets. Ben has yet to learn why the Avenue was dropped from Broadway. Dan jokes that when he moved into the neighborhood in 1952 there were three old men who owned most of the neighborhood, Mr. Howes, Mr. Hoges, and Mr. Schauncker. Mr. Howes owned a number of buildings around Howe St - I suspect there is no relation, but it's worth looking into. Mr. Hoges owned several building on the west side of Broadway between Howe and Blaine, and Mr. Schauncker owned one building and two lots south of Blaine on Broadway. See the stairs page for more information on him. In about 1958 Dan purchased the lot and started construction of the house where they still live. 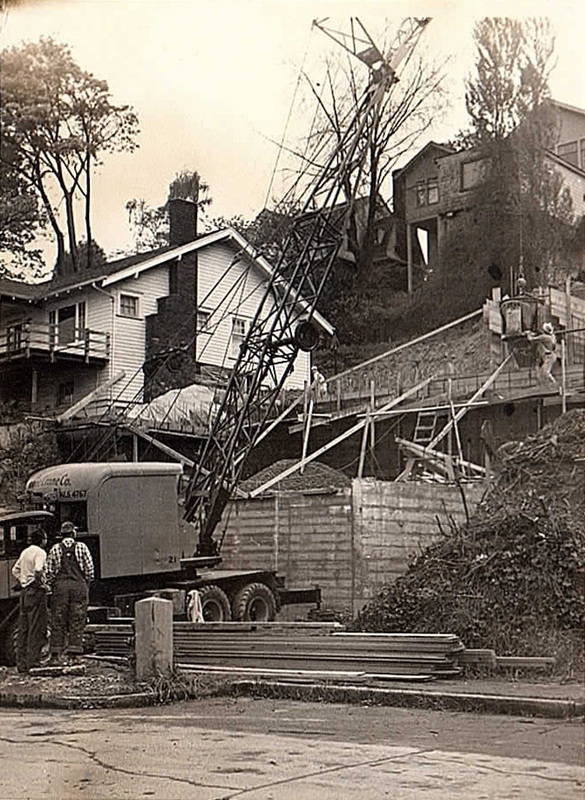 We recently came across several photos showing the construction of the house. The other iconic house in the neighborhood is the 1929 Sears house - presumed to be one of the mail-order homes that the Sears, Roebuck, and Co. shipped by railroad boxcars. These homes would include everything needed for their assembly, Ben has yet to find original plans for the house to confirm it&apos;s origins, but it&apos;s on his "long list". Presumably, the house has had little or no major (structural) changes. It was lovingly remodeled in the late 1990&apos;s, with an eye for fine detail without bastardizing the character of the house. Perhaps the oldest house in the neighborhood is at 1811 and was build in 1904. Ann&apos;s old house was build in 1924. House building booms seem to have been in the 1920s, the 1950s, and the mid-1980s to late 1990s. As the neighborhood has grown we&apos;ve been pretty lucky that nobody has wanted to tear down the older building to build higher density housing. It would really change the character of Broadway to double (or triple) its density.